This morning I woke to perfect sunshine, lovely warm air that wasn’t too humid, a dozen peaches, and the anticipation of my little cousin (she’s 12) coming to visit. I made a peach cobbler (gah, the putzing with the peaches!) and frozen yogurt (awesome) and we had burgers for lunch. Then I took my cousin and son to the pool in this brilliant weather and cleaned the kitchen. It was just a lovely day, full of sunshine and the contentedness of small joys. So I didn’t feel a need to dress up in any manner more than something pretty. I started with this loose dress from AvaGardner Kungler, who is a pro at textures, colors and proportions. Ava always brings elegance to her fashions, even the most casual, and this outfit feels rich even if it’s not “dressy.” I paired it with lace leggings from Tatyana Ultsch, who is also a pro at textures. These leggings will work with asses and mesh bodies but also come as pure system pieces with add-ons, which I prefer. My shoes are darling wedges that Senzati0n Domenitzo is offering in a gacha at the Aloha Fair. Sawsan Secretspy, who is one of the most prolific skin makers in SL, I swear, is offering this gorgeous skin for the Aloha Fair. In several bright, sunshiny make-ups, it’s sure to add warmth to your look. My hair is one of Queue Marlowe’s newest, loose curls casually pinned up in back with her ever gorgeous textures. And my pretty, delicate hanging earrings are Maxi Gossamer’s new offer for Uber. Genre opened earlier this month and the theme was Baroque, so of course, everyone threw their efforts at gilded furniture and voluminous dresses with an eye towards the court of Marie Antoinette. I gathered quite a few things from the event and crowded them into this blog because, as you know, excess was never a concern in the court of Madame Deficit. First my beautifully rendered dress from Dreamfantasia Nightfire, who is a singular repository of beautiful texture and historical sartorialism in SL. Remember when we constructed all sorts of fussy prim pieces for these shapes and now mesh can do it? I have accented the dress with a brooch from Tiffy Vella and pretty little shoes from Arora Zanzibar. My furnishings are all from Genre, including the pictures, vase and chair from Charles Lacrima and the lovely desk, which also includes other chairs and a table from Discovering Destiny. (I can imagine these pieces could be removed from a Baroque RP setting and might do as antiques in an eclectic household.) My mirror from Connie Stratten actually includes six poses for photography and if you’re really handy with PS (and have the patience), you could do your reflection. (I clearly have neither the skills or patience.) My poses are from Genre as well, a set from Nancoix Urquan called Sarabande, which have a lovely drama to them. My sky-high hair from Plurabelle Laszlo comes in several tints (though Marie herself had a light blonde hair) and includes the lovely dark roses you see but I added Kerryth Tarantal’s hair piece as well (because, you know, extravagance). My skin is one that LumiyaRae made specially for this round with the darling little heart-shaped beauty marks and blush Marie Antoinette was famous for. Finally my darling Ladies in Waiting are actually also wearable animated rats (!) that are adorably dressed in baroque costume. You get one to display and one to wear and if you are one of those who likes collecting darling animals in SL, these are custom made for you. Been having a few of those days lately where I just want to go home, sink into a chair, and have a glass of wine while I listen to my favorite music and relax. I feel like I am behind on a few tasks, least of which is showing this fabulous furniture, which I set up a while ago to photo. First there is this fabulous retro living room set from Froukje Hoorenbeek that includes all her fabulous animations, from purely sitting and enjoy a glass of wine to actually enjoying some time with a favorite sweetheart, smooching or more. Who knew such innocuous furniture could hold such hot thoughts? Of course if I flop down on this great massage table from Tya Fallingbridge, someone may come along and give me a massage. Or not. But it sure looks beautiful and tempting in the corner of my bedroom with separate tables of towels and massage oils. This is still at Fameshed for a few more seconds so grab it while you can. Tya has also made this absolutely stunning bed that includes singles and couples poses and some adult surprises. 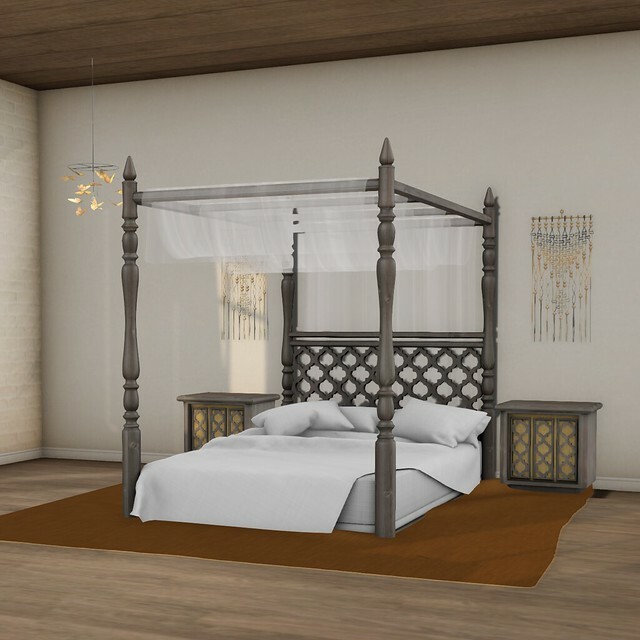 With carved tropical wood and a sheer curtain across the top, it’s a gorgeous bedroom set that she had at Liaison Collaborative and now has in her store. I put wall hangings from Trace Osterham on each side and hung a darling little mobile/lamp from Plethora in the corner. My lovely dress, which I also wore for my video with Phobos, is one of Spooky Mistwallow’s lovely interpretations for this mesh dress. I particularly have loved her patterns, which are proportioned nicely on the dress. My new peeptoe pumps are Eudora3D’s newest and come with matching bracelets, sold separately. Finally I have to brag about this gorgeous skin from Mochi Milena, which she has set up as a free piece for newbies and a very low price for the rest of us mortals. If anyone worries that newbies can’t get good content, they should pull them over to Mochi’s shop to grab this skin. It’s absolutely gorgeous (and ridiculously generous). My hair is lovely braided updo from Mariru Catnap that I grabbed from Fi*Friday before Hair Fair and promptly forgot about, which was a shame because it’s absolutely lovely. Hair: . :CHEVEUX:.F057 Browns01 by Mariru Catnap for .:CHEVEUX:. Eggplants are about to come into season, and I am prepared. The French word for eggplant is, of course, “aubergine,” a much more luscious and beautiful word for their deep purple color. This dress made me think of that word. The color is not as blue black purple as aubergine; it’s more a bordeaux but this is not a blog entry about wine. It’s about eggplant. I love this new dress from Harry Hyx because it’s sleek and structured and beautifully tailored to fit. The design lines in the texture add high style and the criss-crossed straps that don’t quite lay flat and have a believable dimensionality. I accessorized with high heels from Eku Zhong, made to fit the SLink feet, that have a gorgeous gold texture, and earrings from AvaGardner Kungler. I ran over to the Cosmetic Fair Beach Party (which is indoors, so don’t worry about wearing sunscreen), and I found that Stasey Oller has put out this lovely skin for blondes. I have not always picked up on her work because bright pink glossy lipstick is not my thing, but this skin is a great palette for such or for more subtle looks. I chose one of her glossy lips to wear with it, sheer and without teeth. I know people like parted lips but they are very hard to pull off right. My hair is Truth Hawks’ newest for men but also fitted for women. His textures are, as always, luscious and this style really looks great on women who can pull off short hair. Normally I do photos but today I am showing a video that my friend Phobos Jamberoo made so he could help me show the revamped RendeZvous animator. It’s been around a while (8 years!) but JenzZa Misfit and Valdarica Vale have completely redone the scripts on the animator since it’s first iterations. Now you can enjoy all the fun of it (walking together, sitting together, dancing, kissing, etc.) with new features such as same region teleporting, camera sharing, adjustment memory (so if you’re tall like Phobos and shorter like me, you can adjust the animations and it sticks), updated animations and transitions and some new poses. Our favorite new thing was, of course, the canoe, which rezzes and gives you paddles. It’s great fun to take it around the water on a sim. If you want to try this, bring a friend and go to Muse Isle, where they have set up a whole area for checking out the RendeZvous II. There is a swimming/canoeing area, walking paths, sitting areas—the whole scenario for getting the gist of the animator. You can also purchase the animator at Vista Animations, DMC Creations, the Dublin Shop and on Marketplace. I realized a couple days ago that I started my blog five years ago. The first year I blogged every single day, faithfully, and then after year two I kind of let myself off the hook for every day and now I average about 3-4 times a week (or sometimes twice a day as when I was blogging Hair Fair and sometimes not at all as when I was working on the SL11B blog). I also started my blog to get into the habit of writing every day. I had read Haruki Murakami’s book, What I Talk About When I Talk About Running, where he had written about the pain and joy of writing and running, and the discipline of doing both. Doing my blog has enriched my intellectual life and allowed me an outlet to discuss what I am thinking about, reading, and doing. Blogging fashion for SL has changed quite a lot during this time. The number of bloggers has exploded and the whole blogger “industry” has changed quite a bit. I have been lucky as I have wonderful designers who send me things to show in my blog. I have tried to honor their hard work with my own hard work. It’s not always perfect and certainly not the most spectacular, but I have been tried to exhibit consistency and integrity. Thank you to the many designers who have contributed to my blog. I hope I gave you something in return. It has been an honor to be asked to create and contribute to blogs including being a fashion blogger for Koinup, running the Costa Rica fashion blogs and then Dream Seekers Estates, creating the new blog for LivGlam and now Damselfly and Sage Fashions, and running the social media for SL11B, including running their blog (in which I created every single page and entry you see). My biggest honor, of course, was being asked repeatedly to create images for Linden Lab for their splash pages for Second Life and Marketplace. Here is the grand finale: if you are a regular reader of my blog, thank you. You have been my most important supporter, and I would not have kept doing this for five years without you. When people tell me that they read my blog, I am always excited and touched. It is really important to know there is someone out there who “hears” my words and finds something of interest, information or thought for themselves. Without you, there is no reason to do this. I call this “Walk on Air” hair because I always find Wasabi Pills’ mesh hair so delightful. MissAllSunday Lemon was one of the first hair makers to work with mesh, and it shows. Her pieces are well-developed with gorgeous textures and she can jump genres from fantasy to casual in a snap. MissAllSunday’s specialty is the braid, and she uses it liberally in her pieces for Hair Fair. Braided bangs in a winsome face-framing curly ‘do, pigtail braids, and a thick braid pulled to the front, MissAllSunday shows off her mesh skills, even throwing in a windblown look. Her textures and hair colors are lush and shadowed well in her mesh. (It’s not just texture—shadow and highlighting play a part in her hair). And the best part? A part of the sale of each of these pieces goes to Wigs for Kids, which will leave you walking on air.